Goondiwindi Regional Council offers a full range of Building Certification services. Are you planning to build a new dwelling, units or commercial/indstrial building? Contact Council for a competitive quote to undertake the approval process and compliance check. Development permits must be obtained for new buildings or structures, re-erection, alterations and/or addition to any building or removal/demolition and change of classification in the Council Region. Council Officers are happy to discuss proposals with applicants. A list of requirements and the various forms can be mailed or collected from one of our offices. Before lodgement of an application, consultation with Council's Building Surveyor is advisable to ensure land use etc is suitable for the requested development application. Development application forms are available at the DSDMIP website. Council's Building Certifier ensures the required standards of all construction by regular progress inspections. 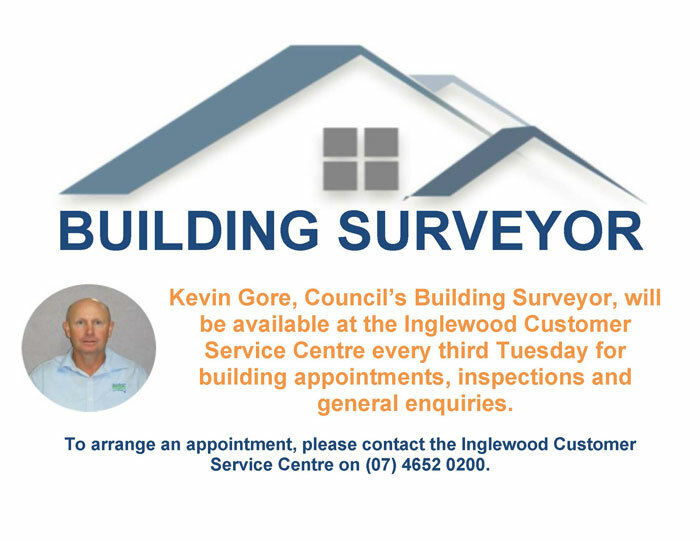 Please check with your local Customer Service Centre or Council's Building Certifier for requirements to obtain a development permit prior to commencing building works. In some instances, a development permit for material change of use may be required under the Planning Scheme prior to building building works. Enquiries about development approvals are best directed to the Goondiwindi Customer Service Centre on (07) 4671 7400. Approval times are generally within five to ten days of lodgement and are normally mailed to the applicant and the owner. Schedule of Building Fees & Charges.